A new service has launched in San Diego offering to deliver the city’s most carefully-crafted commodity directly to your front door: craft beer. 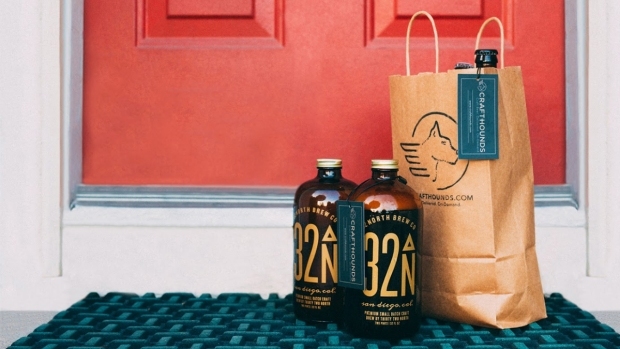 CraftHounds – formed by a group of friends and family with a passion for sharing good beers and hosting “bottle swap” parties at their homes – is a delivery service dealing solely in craft beer. The concept is simple: customers hop on the CraftHounds website and enter their home address to generate a list of craft brews available for delivery in their area. They make their sudsy selections online, pay and, within 30 to 60 minutes, the beer is delivered to their home. Partnering with 26 local bottle shops around the county and a few breweries, the company delivers six-packs, bombers and freshly-filled growlers seven days a week. “We have about 4,000 craft beers right now that you can order,” Adam Gendler, director of product and marketing for Crafthounds, told NBC 7. The vast inventory includes everything from well-known local labels like Ballast Point Brewing Co. and Green Flash Brewing Co., to bottles from around the world and beloved beers that are notoriously difficult to track down. Gendler said rarer gems include Russian River Brewing Company’s Pliny the Elder and Firestone Walker Brewing Company’s Stickee Monkee. “We really take pride in being able to offer those kind of rare finds that you might not be able to find somewhere else,” he explained. “They have over 2,000 beers which is what allows our website to be so great,” Gendler said. Other partner retailers include Keg N Bottle locations throughout the county and Chip’s Liquor in Pacific Beach. As CraftHounds customers peruse their options online, they can compare prices and even hone in on the perfect beer by filtering through characteristics that will best suit their tastes. “You can sort by style, flavor, even down to IBUs, ABV, or even the type of hops, if you want to, so you can really find the kind of beer that you’re looking for,” said Gendler. For now, CraftHounds’ partner breweries include 32 North and Amplified Ale Works. Ten more local breweries will be added to the company’s lineup this month, but those have yet to be announced. As Gendler calls it, this online “craft beer superstore,” aims to open up beer enthusiasts to trying new things and discovering new beers. 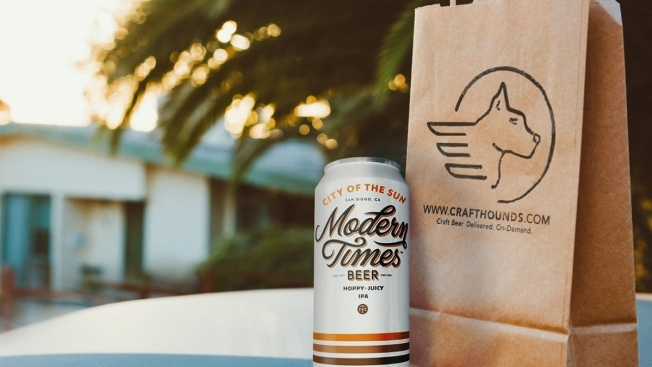 2 Local Eateries Named Among Best in U.S.
Gendler said CraftHounds’ current delivery route stretches from Del Mar in San Diego’s North County to Chula Vista in the South Bay, and from Ocean Beach in the west to La Mesa in the East County. Drivers are based in zones and matched with customers depending on where the customer is located. When a customer places an order, the driver is immediately dispatched to pick up the beer and make the delivery. Once the driver arrives, he or she checks the customer’s ID to verify they are at least 21 years old. “We make sure that we take our compliance with state regulations very seriously – and once everything is good to go, the beer is yours,” Gendler added. Customers must spend a minimum of $12 to use the delivery service – about the price of a six-pack or a couple of 22-ounce bomber bottles. The delivery fee averages between $3 and $6, depending on a customer’s distance from the store that is selling their selections. Gendler said customers can also place an order ahead of time to have it delivered on a specific day, like for a party or even as a weekend treat. Gendler said the company’s busiest times are Friday and Saturday evenings, as people are at home unwinding from a long week. On weekends, Crafthounds averages about five deliveries per hour. “We see a lot of people ordering in or, if they’re at a party, and they don’t want to leave,” he explained. As CraftHounds catches on, Gendler said the company has plans to expand to other beer-centric cities like San Francisco, Portland, Seattle, Denver, Boston and New York City. But, for now, he said San Diego – with its healthy, burgeoning craft beer culture – is the perfect place for the company's pilot launch. “There’s that saying: ‘When the tide rises, all the boats float.’ And, I think, that is really what we’re trying to do. We’re trying to bring together the craft beer community and make one centralized place where everyone can come to just really enjoy craft beer,” he added. This month, CraftHounds has partnered with Paralyzed Veterans of America and 15 breweries across the city to raise funds for the organization. For any order that comes through Crafthounds for a product from one of those breweries (including Belching Beer, Coronado Brewing Co., Latitude 33, to name a few) the company will donate $1 to Paralyzed Veterans of America. To learn more about CraftHounds, click here.